A couple of weeks ago, I talked (ranted) a little bit about the misconception that privacy, as a concept, was a relatively new idea. As I said then, it seems that people often seem to have this idea that our ancestors were not as smart as we are, although I have never found that to be the case. Culturally, medieval people were different than we are now, that’s undoubtedly true, but that doesn’t mean that they weren’t plagued by the same existential questions we are. 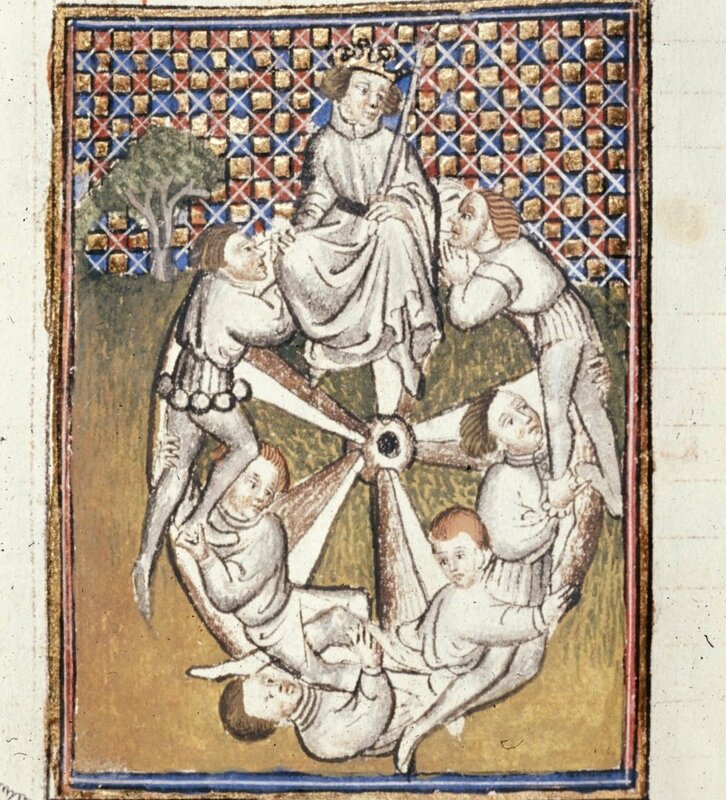 The Wheel of Fortune, at the beginning of Bbook 2 of the The Consolation of Philosophy by Boethius. A case in point, and one of the most wonderful texts to influence and shape the Middle Ages, is The Consolation of Philosophy by Boethius. Written at the very beginning of what most historians consider the Middle Ages (523 C.E. ), The Consolation is the work of a Roman politician, who wrote it while jailed and awaiting execution. Fortunately for us, Boethius takes some time to outline his downfall: some untrustworthy men proclaimed that he was interfering with the testimony of a witness who intended to accuse the Roman Senate of corruption. Boethius insists on his own integrity; in fact, it is because he so genuinely believes in the morality of his deeds that he is tormented by the unfairness of it all, turning to Philosophy for answers as to why good men sometimes fall to evil men. Through prose and poetry, Boethius and his imagined figure of Philosophy discuss how this happens, and what it means in the overall cosmic scheme of things. Boethius’ questions and Philosophy’s answers are framed in a religious light – everything is explained through God’s divinity – but modern readers, religious or not, will find that The Consolation of Philosophy deals with the very questions humanity struggles with today: why are people evil? Why do bad things happen? Is it worth being moral when it doesn’t always pay off? Through carefully-structured logic, Philosophy leads Boethius from despair over what he’s lost, to hope and acceptance. As you can see, Philosophy covers quite a lot of ground, from Fortune’s capriciousness to the nature of free will in the divine plan, making this a very thorough and sophisticated examination of major theological questions. By the end, Philosophy reassures Boethius that he has lost nothing of value by losing his place in politics or his fortune. Instead, he must only concentrate on what he can do to live morally, and the rest will take care of itself. For hundreds of years, The Consolation of Philosophy was painstakingly copied, and copied again by hand to bring reassurance to medieval readers (and listeners) who questioned their own fates and fortunes. Clearly, people found Boethius’ words to be both relevant and resonant to them, and modern readers might easily find them to be so, as well. “Let us rise, if we can, to the summit of the highest intelligence,” (Book V, Prose 5, p.114) Philosophy said to Boethius centuries ago; let us recognize that intelligence in our ancestors as we work towards finding our own modern consolations.